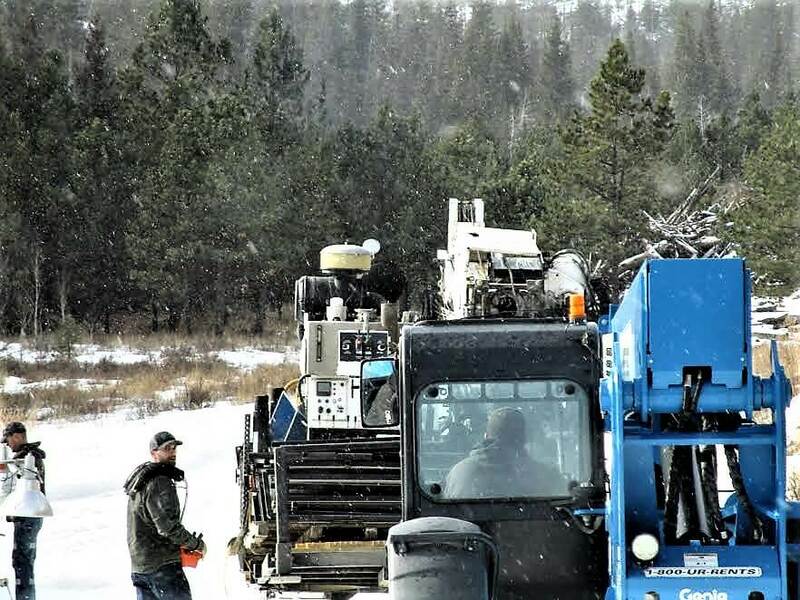 RAPID CITY – As prospectors’ drill rigs moved in on the Rochford Gold District adjacent to the Lakota sacred site of Pe’ Sla on Feb. 6, tribal constituents warned the Pennington County Board of Commissioners that Black Hills mining proposals should require consultation with the authorities of the Great Sioux Nation. The board of commissioners, listening to the testimony from Rosebud and Oglala tribal members, as well as others at its regular meeting, voted to delay a first reading of the planning commission’s proposed mining ordinance amendments until a Feb. 13 special meeting for further public comment. 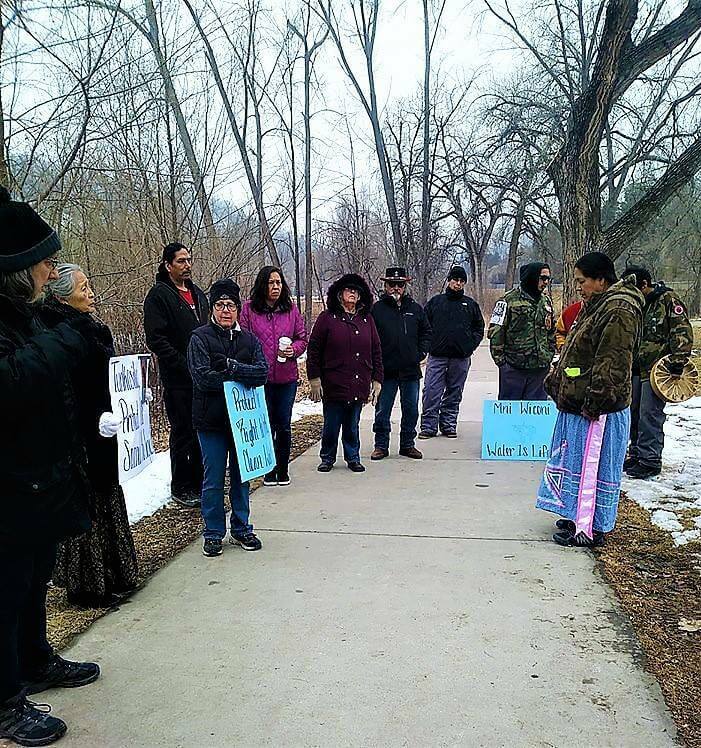 The ad hoc Magpie Women’s Council subsequently scheduled a prayer walk to the meeting from the bandshell on the banks of the Mniluzahan Wakpa (Rapid Creek) to “call attention to efforts to mine in the Black Hills,” using water from the creek upstream from Rapid City. The Rosebud Sioux Tribe opposes the exploratory drilling for gold on lands near the sacred Pe’ Sla, “based upon continuing violations of the 1868 Treaty of Fort Laramie provisions and upon the threat of toxic mining waste pollution into the water and environment surrounding Pe’ Sla,” Phil Wanbli Nunpa, executive director of the Sicangu Lakota Treaty Council, told commissioners. He quoted from a tribal resolution that Rosebud Sioux Tribal President William Kimble sent for inclusion in the county records and the U.S. Forest Service process that would determine Pe’ Sla area exploration permit locations on public land. Pe’ Sla, the “Heart of Everything,” is a high mountain meadow central in the Oceti Sakowin cosmovision. Due to its crucial cultural role within the Black Hills, the Seven Council Fires of the Great Sioux Nation paid $9 million to buy back the 2,000-acre Reynolds Ranch occupying it, then put the land into tribal jurisdiction under federal trust status. According to the 1868 Ft. Laramie Treaty between the United States and the Great Sioux Nation, the Black Hills, including Pe’ Sla, still belongs to the Lakota, Dakota, and Nakota tribes, as do all lands in South Dakota west of the Missouri River and some lands in four adjoining states. A 1980 U.S. Supreme Court decision affirmed that the tribes’ jurisdiction had been illegally usurped, offering a monetary compensation. The tribes rejected the payout and have lobbied since then for a settlement to return the portion of the Black Hills that is under federal management. Now, Mineral Mountain Resources Ltd., based in Vancouver, British Columbia, Canada, has consolidated a block of claims between Rochford and Pe’ Sla. It is starting to prospect in a venture it anticipates will be as profitable as the famed Homestake Gold Mine in nearby Lead. The mine “moved several large hills, and left behind a huge crater, a contaminated river, and a Superfund site,” the grassroots Black Hills Clean Water Alliance said Feb. 7, in rallying constituents to request that South Dakota Gov. Dennis Daugaard, as well as Environment and Natural Resources Secretary Steven Pirner, revoke the exploration permit. “The current staging area is not in the place that the company said it would do its staging, and we believe it might be illegal,” the alliance said. The company’s South Dakota subsidiary obtained a state permit transfer Jan. 18 for drilling 33 holes on some 7,500 acres in Pennington County at the Rochford Gold Project. The company also obtained a temporary state water rights permit renewal for its drill rigs on Jan. 2, enabling it to withdraw 1.8 million gallons from the Mniluzahan Wakpa, at a pump rate of 200 gallons per minute, through the end of April. Pennington County’s moratorium on mining expires that month, prompting the insertion of wording in the new county ordinance amendments to provide oversight on minerals, such as gold, uranium and vanadium, at existing claims. Citizen involvement in the crafting of the amendments convinced county elected officials to create a new committee to follow up on work done by the previous one they formed to oversee many months of work on the latest amendments. 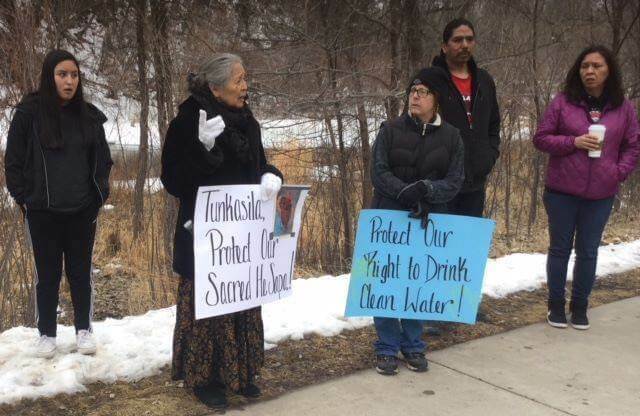 Meanwhile, Indian reservation-district members of the state legislature, at the request of Cheyenne River Sioux Tribal Chair Harold Frazier, introduced a bill to require public notice of temporary water use permits for drilling exploration. It failed in the House Natural Resources Committee on Feb 5. However, another bill they introduced about the mining, HB 1224 was scheduled for hearing on Feb. 12 in the House Commerce and Energy Committee. Cheryl Angel, a tribal cultural surveyor born in the Black Hills, was one of the first speakers of many at the commission meeting to urge establishment of mining rules to retain local control over water and reinforce federal recognition of the tribes’ sovereignty in matters of historic preservation. “Pe’ Sla is the site where we came from and where we’re going to go back to. This is our homeland for tens of thousands of years, for tens of thousands of people like me,” Angel said. “The places that are sacred to us aren’t being recognized and they’re being endangered. “Tribal Historic Preservation Officers have jurisdiction and actually mark those areas, so our tribe knows where all these sacred sites are, but the State Historic Preservation Officers do not,” she said. Pennington County Oglala Lakota resident Tonia Stands said at least 16 tribes are “connected” to the Black Hills and “it’s in the treaties so that’s what we stand on: The Black Hills were never for sale. The Black Hills aren’t for sale,” she said. Reservation-district state legislators mirrored the demand for greater protection of Native American historical properties by introducing SB 197, scheduled for hearing Feb. 12. “I’m concerned about the farmers and ranchers and if their water is contaminated, because of the thousands of gallons that would be required in the mining or even in the exploration. Due to the current absence of a county ordinance for hard-rock, underground, open pit or aquifer exploration and mining, residents have been caught unaware of the large-scale operations underway. Rapid City resident Rick Bell noted. “I was out hiking the Rochford area, and there are a lot of people who don’t have any idea what’s coming their way in terms of just disruption. If they don’t know about mining rights below their property, they’re gonna get destroyed, and this is such a beautiful area,” he said. “Again, our Native American brothers and sisters find it very sacred, and I just hate that Mineral Mountain Resources mining company has said they’re gonna make another Homestake Mine out of this area,” he added. Another Rapid City resident, Gena Parkhurst suggested that all commercial mining in Pennington County be subject to conditional-use permit approval by the County Board of Commissioners. Prairie Hills Audubon Society President Nancy Hilding agreed and told commissioners: “We hope that you will keep discretion” in permitting decisions. The ordinance should provide that public appeals of permit approvals are automatically granted, she added.